A cross post from Feminist Flashback on BitchFlicks. When I was young, my mom raised me on classic films: Gone with the Wind, Casablanca, The Great Escape, Breakfast at Tiffany’s. I fondly remember watching Elizabeth Taylor on-screen. Hollywood royalty, we often think of her arresting beauty, numerous marriages, struggle with alcohol, philanthropy and perfume commercials. It’s easy to forget she was an amazing actor; a stellar artist who fluidly exuded strength, sensuality, vitality, passion and pain. Starring in over 50 films, Taylor often chose feminist roles. In National Velvet, she plays a young girl disguising herself as a male jockey to compete. In Cat on a Hot Tin Roof, she’s a fiery survivor embracing her sexuality. And in the Texas saga Giant, she plays an educated and outspoken woman, challenging sexism. So after years of my mother urging me, I finally watched Taylor’s legendary performance in Who’s Afraid of Virginia Woolf? Based on Edward Albee’s Tony Award-winning play (it also won the Pulitzer although it wasn’t awarded it due to its vulgarity and sexual themes), the 1966 film follows Martha (Elizabeth Taylor) and George (Richard Burton), a middle-aged married couple. He’s an assistant professor at a New England college and she’s his wife who happens to be the college president’s daughter. Through their vitriolic and bitter alcohol-fueled feuding, they lash out at each other. When a young couple, new professor Nick (George Segal) and his wife Honey (Sandy Dennis), visit their house after a late-night party, Martha and George continue their battle of wits, interchangeably attacking their guests and using them as ammunition, to further lash out at one another. 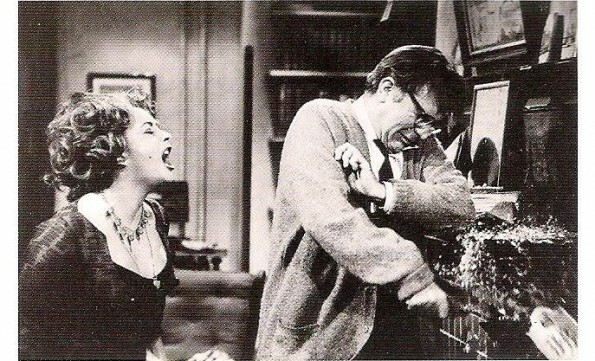 Director Mike Nichols wanted to have real-life married couple Taylor and Burton star in the film, a celebrity couple famous for their off-screen turbulent relationship. Known for its acerbic dialogue, Martha and George sling verbal barbs throughout the movie. Martha continually insults George calling him a “dumbbell,” saying he makes her want to “puke.” Critics often focus on Martha’s vicious verbal attacks but George equals her venom. He says she makes him “sick” and equates her voice to “animal noises.” Their guests Nick and Honey initially appear to be the quintessential couple, contrasting Martha and George in appearance, age and demeanor. But as the night wears on and more alcohol is consumed, the problems both couples face come to the surface. I’ve read that Who’s Afraid of Virginia Woolf? is a feminist film. But when I started watching, I initially thought, what the hell? There’s no way this is feminist as it’s mired in misogyny! The film follows George’s perspective as there are scenes with just George and Martha, George and Nick, or George and Honey. George is almost omnipresent. Also, there a few violent scenes in which George attempts to strangle Martha, pushes her, shoves her against a car and pretends to shoot her with a gun (an umbrella pops out instead of a bullet). But when you begin to peel back the layers, you realize that while it might not be an overtly feminist film, feminist tendencies emerge nonetheless. In the 1960s, the domesticity paradigm for women reigned. In the beginning of the film, Martha tells George about a Bette Davis movie she’s trying to remember the name of. She says, “She [Bette Davis] comes home from a hard day at the grocery store.” George snidely and skeptically replies, “At the grocery store?” to which she retorts, “Yes, the grocery store. She’s a housewife, she buys things.” Women were expected to be docile, obedient wives and mothers tending the home. Yet this revealing exchange shows the disdain for domestic duties women in the 60s faced. Martha: I hope that was an empty bottle, George! You can’t afford to waste good liquor, not on your salary, not on an associate professor’s salary! Nick: To you, everybody’s a flop. Your husband’s a flop, I’m a flop. Martha: You’re all flops. I am the Earth Mother, and you are all flops. In a time when women weren’t supposed to have jobs beyond wife and mother, perhaps Martha wanted her own career. As she came from a wealthy family, Martha had money so she didn’t need George to succeed for fiscal security. It seems as if Martha lived vicariously through her husband and his capacity for success which would explain why his lack of ambition was such a blow. As someone in their 30s who doesn’t have children (and isn’t even sure I ever want them), even in this day and age, people often act as if there’s something fundamentally wrong with you if you don’t have or want children.Martha invented the story of a son probably because she genuinely wanted one. But I think she also did it to make it easier for her to fit into society. As a woman, I often feel I don’t fit the stereotypical mold of what a woman “should” be. Perhaps Martha, with her abrasive, obnoxious persona, wanted at least one component of her life to fit. While I genuinely believe Martha wanted a child, her yearning may be tempered by the fact that society views her as an inadequate woman. It’s as if she can handle being a non-conformist woman in every way possible except this one. Martha: I’m loud and I’m vulgar, and I wear the pants in the house because somebody’s got to, but I am not a monster. I’m not. Martha: SNAP! It went SNAP! I’m not gonna try to get through to you any more. There was a second back there, yeah, there was a second, just a second when I could have gotten through to you, when maybe we could have cut through all this, this CRAP. But it’s past, and I’m not gonna try. Wives were supposed to support their husbands, echoing their desires. While Martha eventually admits that George is the only man who has ever made her happy, she refuses to silence herself. She is loud, vulgar, shrewd, intelligent, assertive, sexual and outspoken; the antithesis to femininity. And in many ways, society punishes Martha and women like her for it. Yet she rails against constraints, struggling to navigate the sexist terrain on her own terms. Some scholars assert that this alludes to being able to live without illusions, which both George and Martha, with their web of lies and treacherous games, clearly find difficult. But the play/film’s title is also an accidental feminist reference as feminist author and writer Virginia Woolf famously advocated for women to be able to possess their own money and space to be creative and ultimately themselves. Captivating yet uncomfortable to watch, Who’s Afraid of Virginia Woolf? depicts the brutal deterioration of a marriage and the crumbling of hopes, ambitions and illusions. Through their cruel taunts and insults, the film exposes the illusory facades people create, while challenging stifling gender roles. In the 60s (and to a large extent still today), society demanded men act assertively and women behave passively. As men wield a disproportionate amount of power over women, people often fear female empowerment. Despite her brazen outspokenness, Martha might be afraid too — afraid of her own power in a society that doesn’t embrace or accept powerful women.